MARC STEINER: Welcome to The Real News Network, folks. I’m Marc Steiner. Good to have you with us once again. Yesterday there were four primaries and one special election in the United States. We have primaries in Kansas, Missouri, Michigan, and Washington, with a special election in Ohio. And many folks thought that the progressive movement in this country could follow up on the victory of Alexandria Ocasio-Cortez in New York City. But that didn’t quite happen. But things did move forward. There were interesting elections that took place. We’re going to analyze where that’s going, what it means for the movement, what it means for the struggle within the Democratic Party, and what it might mean for the general election, with a man who interviewed many times over the years and a really great analyst, John Nichols, who is the national affairs editor and correspondent for The Nation. And John, welcome. Good to have you with us. JOHN NICHOLS: It’s great to be with you, Marc. MARC STEINER: And his latest book is Horsemen of the Trumpocalypse, which actually fits into this conversation very neatly, I think. JOHN NICHOLS: It fits into every conversation. MARC STEINER: Unfortunately you’re right. Let’s dive into what happend in the elections yesterday. There were a number of progressive candidates backed by Brand New Congress, Justice Democrats, Our Revolution, a number of other groups. And very few of them actually actually won their primary battles. So I wonder how you would assess what happened, what these elections meant yesterday. JOHN NICHOLS: Sure. Well, let’s begin with those races. And I’ll tell you flat-out, having interviewed a lot of the Brand New Congress, Justice Democrats folks, you know, what they will tell you is that they’re going into tough races. They aren’t just doing what a lot of national groups do, which is pick pretty secure, pretty safe races; pretty secure, pretty safe candidates. They’re endorsing candidates who are running uphill races, sometimes against incumbents, as was the case with Cori Bush running against Lacy Clay out in Missouri, for instance. And those are not races that you’re necessarily guaranteed to win. You fight them because you think they should be fought; you fight them because you may be laying down a marker for future races. And also, one final thing that I think people lose sight of in this case- and this is not to make excuses. I mean, there were losses. There’s no doubt of that. But you also fight to turn people out, because that may influence other races. So let’s look at that Cori Bush race in St. Louis, in the St. Louis area, for instance. She got about 36-37 percent of the vote. That’s pretty good for a challenger to a long-term incumbent. But here’s what else happened in the St. Louis area. You had this high turnout, and you had the sitting prosecuting attorney, the prosecuting attorney who failed to take the lead, failed to do what was necessary after the Ferguson tragedy and the killing of Michael Brown. And he was defeated by a 57-43 margin. A young lawyer named Wesley Bell won that race. You also in Missouri had a referendum on labor rights, a very important vote, and that referendum the labor side won overwhelmingly. So one thing to put into the mix here is that when you’re getting into, you know, a particular race, yeah, of course if you’re an activist group, if you’re an activist candidate you want to win that race. But if you’re serious about politics you also want to turn people out and get energy up to win other races, as well. So I think that’s one perspective to bring to all of this. MARC STEINER: I want to come back to the Missouri referendum in a moment. But I was thinking about your book, the Trumpocalypse; the Horsemen of the Trumpocalypse, which- I love that title. JOHN NICHOLS: And you pronounce it well, which is very impressive. MARC STEINER: But one of the things you’re also watching in these races is that in the Republican primaries, the candidates who have been backed- not all the time, but many of the candidates who have been backed by Donald Trump, who support Donald Trump, are part of his kind of world inside the Republican Party, have been winning. And I wonder what this, what you, how you analyze these movements that are doing that inside the Republican Party. At the same time, what effect the progressive movement is having inside the Democratic Party. Because it’s also seeing that the more establishment liberal and moderate candidates and incumbents in the Democratic Party are calling themselves progressives, and mouthing some progressive phrases. So what do you think the dynamic here we’re watching is? JOHN NICHOLS: Well, I think what you are pointing to is a reality that’s very important to be aware of, and that is that both parties are in the process of radical change. And they aren’t in that process of radical change simply because of movements. They are in that process of radical change simply because particular candidates have stepped up, or particular, you know, political movements have come into play. They’re also changing because of the times we live in. We are 30 years into a globalization revolution; we’re 20 years into a digital revolution. We’re ten years into an automation revolution. People are realizing that the politics of the past doesn’t work anymore. Now, the Republican Party’s answer to that, quite frankly, is to go further to the past. You know, this make America great again. To blame immigrants, to blame refugees, to blame, you know, just about anybody they can look at for why things aren’t the way they were, and why things aren’t the way they want them to be. In the Democratic Party you have a transition where a lot of progressives are coming in and saying, look, this Democratic Party as it currently exists, as it currently speaks to people, is not effective enough to excite young folks, to excite people who are worried about all of these changes. You have to adjust your message. You have to, frankly, become a much more progressive party. And so I think that the times are forcing both parties to more clear positions. And the Republicans have clearly become a right-wing populist party. I think the Democrats will become much more of a left-wing populist party as time goes on. And I wonder what the dynamic will mean in America. It sounds like- could we be seeing in some ways the splitting of these parties, as the Whigs fell apart and Republicans were created in the 1850s? I mean-. JOHN NICHOLS: Well, you know, we’ve been waiting a long time for a new party, right. 1854 was a bit of a while ago. MARC STEINER: Yep, a little bit. JOHN NICHOLS: Yeah. The counsel I would give you is this: The political parties have gamed the system from top to bottom with money, with gerrymandering, with a host of other political interventions and structural interventions that make it very, very hard for new parties to develop. This is a reality that we have to recognize. And when we recognize it, then you understand why so much of the energy goes into fights within the existing parties. Now, here’s the interesting thing that happened. The hard right, in my opinion, and particularly the corporatist right, came in big to the Republican Party. And in many senses they have transformed the Republican Party into something they want. I’m a critic of it. I’m not a fan of what it’s become. I think it’s abandoned the basic premises of what the Republican Party was founded to be. But it has changed. It has become the party of Trump. With the Democratic Party it’s a much grayer area, a much more uncertain area. But ultimately I do think the Democratic Party is going to be forced to become dramatically more progressive, even social democratic on a host of issues. And that may result in the, in some of the corporatists and some of the money people trying to create a new centrist party, or something, you know, that sort of swims between the two. But I want to emphasize, I don’t think that a new centrist party is going to develop out of the grassroots of the American people. My sense is that the changes that are occurring in our economy and in our society are likely over time to move people to the left. I don’t say that because that’s where I’m at. I say, you know, when you have a situation where traditional work is being radically changed, where jobs will not be as well defined, where people will be in the gig economy less likely to get a traditional benefit package, a traditional pay package, there’s going to be much more demand for Medicare for All, single-payer healthcare. There’s going to be much more demand for free education. There’s going to be much more demand for free and low-cost transportation. And so that isn’t a left-right thing. It happens to end up that those are a lot of left-wing positions. But it’s a thing, it’s a practical reality. And so a centrist party that argues against that and says, oh, yeah, we’re just going to maintain the status quo. People aren’t happy with the status quo. I think that, you know, obviously the Republicans are trying to pull them toward something in the past that cannot be recreated, and frankly is very damaging. But the Democrats at this point haven’t shown enough leadership to pull toward the future. And I don’t think a centrist party would do that. MARC STEINER: So let me take very quickly two aspects of yesterday’s primaries and talk about what they may mean. We mentioned it briefly at the beginning of our conversation. The first thing is the vote in Missouri that, that stopped the right to work; that said we ban, we don’t want right to work in Missouri. Which actually confronts, also, the Janus decision the Supreme Court just handed down that really hurt public unions, and unions in general. So this sets up a dynamic for the unions, as well. So talk a bit about that vote and what you think that means. JOHN NICHOLS: I think the Missouri vote’s the biggest [inaudible] of yesterday. The biggest deal of yesterday. Because it’s a structural vote; it’s not merely about candidates, or even movements. And obviously those votes are important. But a structural vote is one where the people are given a chance to actually weigh in on a major issue; how they define, in this case, a substantial portion of their economic life. And what you saw in Missouri was in a state where Donald Trump won- but so did Mitt Romney. In fact, Republicans have won the last five presidential elections in Missouri. You also have a state where the Republicans hold the governorship and control the legislature. This should be a conservative, Republican, traditional state. And yet they were given a chance to vote on whether they want strong unions; whether you want unions that can go up against corporations, that can fight in the workplace, but also in society, for fair wages, better benefits. Some protection of public services. Things of that nature. And amazingly- well, I don’t think amazingly, but strikingly- 67 percent of people voted for strong unions. It’s a two-to-one margin. And you know, the same thing happened in Ohio a couple of years back. They had a vote on a union issue, and you had 62 percent of people voting for strong unions. Here’s what I think is happening. I think working-class people and middle-class people are looking at the economic realities around them and saying no, I don’t want to give it all the way to the corporations. Maybe these folks aren’t all big liberals; maybe they aren’t all left wing on everything; but they know that over-the-top corporate power is bad for them, bad for their communities. And so, you know, when people are given a chance to vote on whether they want strong unions or not, the interesting thing is they vote for them. MARC STEINER: It’s true. And I think that will be interesting to watch to see if the unions in America actually pick up on this and begin to see they have more power than they think they have, given all they’ve lost. So this is, this will be an interesting dynamic, to see how that unfolds over this election and beyond. And the other election that I found interesting, Rashida Tlaib won, and probably guarantees her a seat in the U.S. Congress. She takes Conyers’ seat, who’s retired from the House, and she’ll become, would become the first Muslim-American woman to sit in the U.S. Congress. And was backed by Brand New Congress and other progressive groups in this country. So that was, that was an interesting victory. JOHN NICHOLS: It was a victory. And you see, that’s where- you know, when-. Look, I cover politics for a living, and I’ve never, ever seen an election where everybody got everything they wanted. Or one where nobody got anything they wanted. The fact is, elections- especially when you’re in really this intense competition to define a political party- are going to give you a lot of results that are going to come from all over the place. 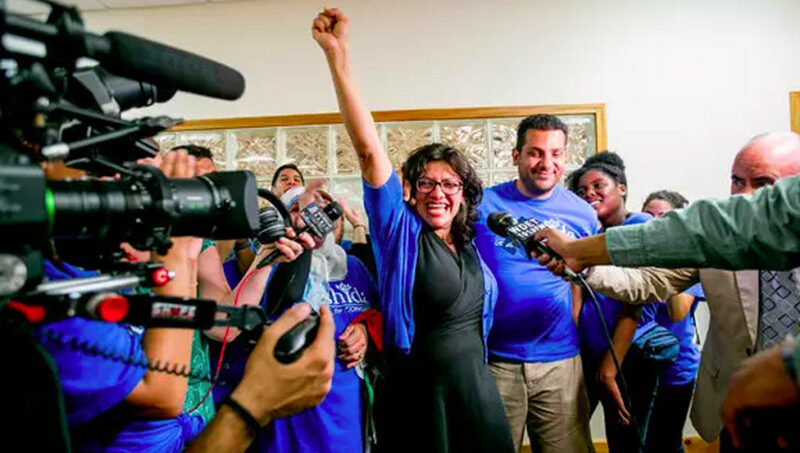 The Rashida Tlaib victory in the Detroit area is, I think, a pretty remarkable one. That is the district John Conyers represented. It’s been redistricted, gerrymandered, turned around, twisted over the years. So it’s not, you know, exactly what Conyers always represented. But it’s, you know, basically the district he had for a good period of time. And it sent one of the most progressive people to Congress. He was forced to retire about a year ago, a little over a year ago, or- right. And it was as a result of a Me Too controversy, and one that we should take seriously. But Conyers did serve in Congress as a very progressive member. And the question was would that district, in a multi-candidate field, elect someone or nominate someone who would be as progressive, perhaps even more progressive in some ways, than John Conyers? And they did. And Rashida Tlaib has been a state legislator, an activist in the streets protesting on behalf of worker rights, single-payer healthcare, but also immigrant rights, refugee rights. And her victory is a very big deal. She will get to Congress. She will be, you know, I think a particularly significant member. And so that result is one that I’ve watched with, frankly, great interest. MARC STEINER: Me too. A lot of the variables to that, especially in the battles over Israel-Palestine, Middle East policy, there’s a lot here, as well as with Medicare for All nationally. So there are things we have to really watch. And we’ll be watching these, and having more in-depth discussions in the coming weeks through these primaries and through the general election. We’re facing some really important issues and a very important election coming up this year, and Real News will be there to cover all that we have to cover for all of us to understand what’s going on; and talking with people like John Nichols, the national affairs correspondent for Nation magazine. He knows a lot about our national politics and more. John Nichols, always a pleasure to have you with us. Thank you so much for joining us. JOHN NICHOLS: It is a tremendous pleasure to be with you, Marc. I’m glad you’re doing this show. MARC STEINER: Thank you. See you down the campaign trail. And folks, I’m Marc Steiner for The Real News Network. Thanks for watching, and we’ll be back. Take care.